PASSHE Summer Honors Trip 2019 to Poland! Two students from the Cook Honors College will be chosen to participate in the 2019 PASSHE Summer Honors Program to the Jagellonian University, along with 26 other students from all of the PASSHE Honors programs. APPLICATION DEADLINE: February 18th, 9 AM. Submit one essay exploring the importance of travel as an aspect of your educational journey. Discuss previous travel, both in and out of the country, and what it has meant to you. If you have not traveled much, then discuss what this opportunity means to you. What about this trip excites you and intrigues you intellectually. Limited to two pages, double spaced. SUBMIT ELECTRONICALLY OR HARD COPY TO KEVIN OR DR. FINEGAN. The 2016–17 McNair Scholars Application deadline is December 2, 2016. The McNair Scholars Program is a federal TRIO program funded at 150 institutions a cross the United States and Puerto Rico by the U.S. Department of Education. McNair participants are either first-generation college students with financial need, or members of a group that is traditionally underrepresented in graduate education and have demonstrated strong academic potential. The goal of the McNair Scholars Program is to increase graduate degree awards for students from underrepresented segments of society. The Boren Awards fund students to study in regions that are ‘underrepresented’ in study abroad programs, such as in Africa, Asia, Central and Eastern Europe, Eurasia, Latin America, and the Middle East. Boren Awards recipients are required to work for the federal government for at least one year after graduation, preferably in a national security agency. 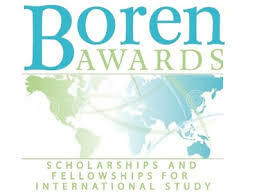 Craig Fredrickson, a Program Officer for the Boren Awards, will be at IUP on Oct. 5, 2016, at 5:30pm in HSS 220 to talk about the Boren Awards and how to write competitive applications. IUP Study Abroad Scholarships – Apply Now! IUP students are eligible to compete for two study abroad scholarships. One is given by the College Language Association, and is named for our late colleague Dr. Caroll Mills Young, who was instrumental in establishing this scholarship. The other is given by the Honor Society of Phi Kappa Phi. Applicants must submit a letter of acceptance to a study abroad program, or a statement that they have applied for acceptance into a program. If you are interested in applying for financial support for study or service abroad, an internship, or any other academic enrichment that you can justify for the Spring or Summer of 2016, now is the time to act. Two study abroad scholarships are now available from the College Language Association. One is named for Dr. Caroll Mills Young, who was instrumental in establishing this scholarship. The other is given by the Honor Society of Phi Kappa Phi. Please consider applying for either or both of these if you are planning to study abroad in summer 2015, fall 2015, winter 2016, or spring 2016. Applicants must submit a letter of acceptance to a study abroad program, or a statement that they have applied for acceptance into a program. CHC Achievement Fund Application Process Now Open! If you are interested in applying for financial support for study or service abroad, an internship, or any other academic enrichment that you can justify for the Summer of 2015, Fall of 2015 or Spring of 2016, now is the time to act. Applications for the 2015 Women’s Leadership Awards will be available online at www.iup.edu/womensleadership. All applications must be submitted no later than 4:00pm on Friday, March 6, 2015. A private reception will take place for nominees and recipients on Wednesday, April 1, 2015.